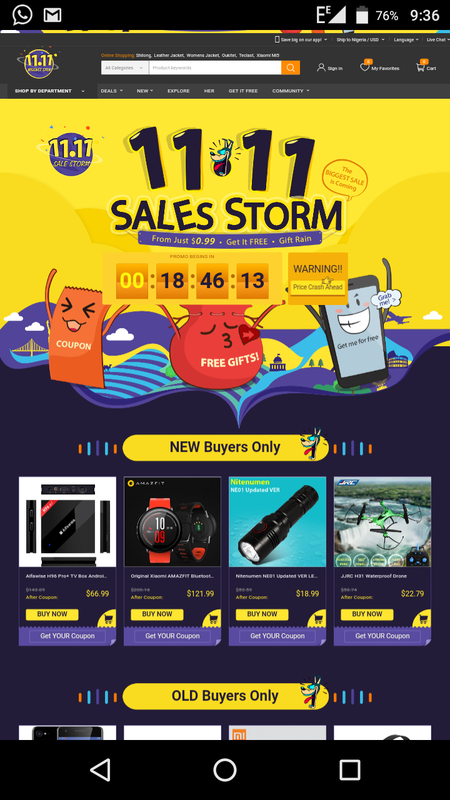 Gearbest 11.11 Single Day Sales Storm Promo is Here. The sales storm is about 11.11 single day celebration, a very big day event celebration in China for single unmarried male and female young people. Gearbest is taking advantage of this event festival celebration to offer alot of unbelievable free gifts and coupons for online shoppers. The sales storm will start from November 7 and end on the 15th of that same month this year. The promo will begin everyday UTC 12:00AM GMT + 1 hour (West Africa Time), 7th to 15th November 2016. It will start from just 0.99cent and include lot of free gifts for new buyers, old buyers, other lot of cool categories and hot brands. Everyone loves FREE stuff! But you better be fast when our Coin Grab starts! Get awesome points, cool coupons and even FREE Gifts. Share on one of following channels to start the Gift Rain! (2) The first rain happens at NOV 7 @ 16:00 UTC. (3) Gifts rain last 3 minute on each specific times. 1. You can check your gift in your GB Account. 3. Share to more channels and social networks for a bigger chance to win cool stuff! 4. GearBest reserves the right to amend this activity, guidelines and prizes for this 11.11 Promo. If you have any questions, please contact our Support Staff. Grab YOUR **PANIC BUYING Coupon** from NOV 7-11 @ 16:00 UTC BE FAST: Limited QTY! This section contains Brand Coupons and a lot of categories coupons to get limited flash deals and buy item's at lower price for the single day celebration. Lots of Price Crashes Ahead !!! You can get products and gifts for free by simple sharing. This is different from the gift rain category so you have to try it out. This will also give you a chance to make money and become a gearbest affiliate too. (3) Send invitation emails. Afterwards, tell them to register and complete an order through your link! *Click "Get it FREE" button to share. *Invite friends to register via you link and complete a payment transaction. 2. Your friend's total order value should exceed yours. The purchase of goods can be more than one item, but must be within an order. 3. Can l share any item at any price? You can share items below $50. The higher the price of the shared item, the more friends you need to invite and place an order. *1 new user can only provide 1 effective order. 4. A nominal $0.01 handing fee is charged if your order ONLY contains the FREE product; The fee is waived if your order contains other items. 5. If orders have been refunded, it will not be regarded as your qualified orders. 6. Each item is only eligible for a single free offer. 7. GEARBEST routinely checks all referrals and new registrations; We reserve the right to delete any suspicious accounts. You really cannot afford to miss this great opportunity here, check out the sales storm promo page here to get started there are alot of free items and gift to be Won. You can even become a proud owner of the Latest smartphone simple by sharing this with your friends. Try it Now!!!!! Phonetweakers: Gearbest 11.11 Single Day Sales Storm Promo is Here.